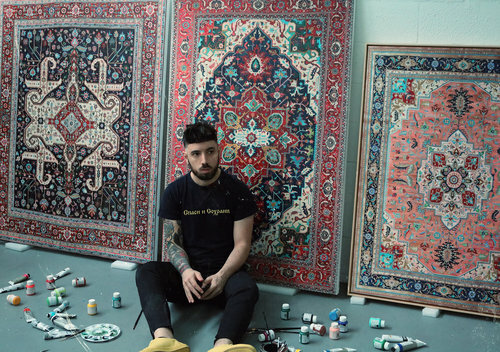 Jason Seife, born in 1989, is a Miami based artist that has reimagined the production of traditional Persian carpets. Highly influenced by the Renaissance era, Seife is known for reinventing old works in new mediums and color palettes that were not available or commonly used during that time. With a background in graphic design, he aims to play with symmetry, geometric shapes and imagery laden with symbolism to bring these designs into our current era. Inspired by the complex artwork of weavers, Seife’s creations reflect and pay homage to their practice. Merging modernity with classic style, he renders the intricate patterns of old Persian carpets with a mixture of acrylic and ink. While the paintings utilize familiar motifs in rug design like leaves and geometric shapes, Seife introduces colors not normally associated with the heavy textiles. Seife has exhibited internationally and his work was recently incorporated into a special facade project artwork with The Bronx and Brooklyn Museum. He initially made a name for himself when he designed Big Sean’s famous lion Jesus in 2011. Before entering the fine art sector, Seife also created cover art pieces for artists such as Pharrell Williams and Mac Miller.